The Obama Foundation released plans last week for the presidential center it plans to build in Chicago’s Jackson Park, but behind the scenes, a battle is taking place to keep the former Democratic president from building on that specific lot of land, and there’s still a chance that it gets delayed when it seeks federal approval. 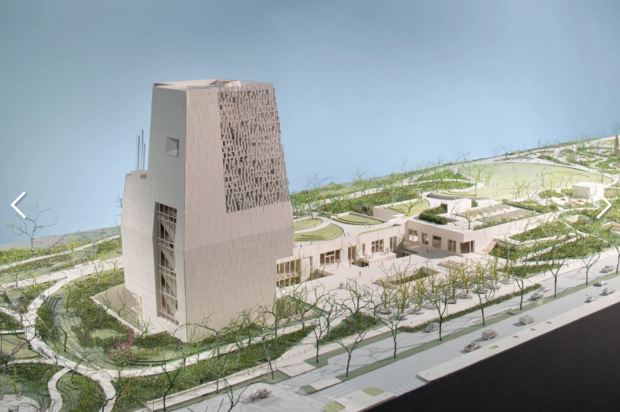 What initially started out as a library has morphed into a 20-acre private “center,” and some environmentalists and historians are unhappy with the Obama Foundation’s plans to swoop in and take over a national historic place. The Obama Foundation originally said it would house a presidential library on the property and vowed to have the National Archives oversee the facility because of its placement on public land. But that’s no longer the case, and some are balking at the change in plans. “Here’s our bottom line. If the Obama Foundation wishes to construct this center on Chicago’s South Side, that’s fine, but not on parkland held in public trust. The University of Chicago, which orchestrated the winning bid for the project, has plenty of land on the South Side that they could and should use. Instead, they’ve been adamant since day one that they must have historic public parkland for the purpose,” Charles Birnbaum, president and founder of D.C.-based nonprofit, the Cultural Landscape Foundation, told the Washington Examiner in a written statement Saturday. The foundation is not alone. The group is working alongside a number of others, including Friends of the Parks, Jackson Park Watch, Openlands, National Association for Olmsted Parks, Save the Midway, Landmarks Illinois, and Preservation Chicago, all of whom have raised concerns about the project. In addition, 200 faculty members from Obama’s former employer, the University of Chicago, issued a formal letter last Monday stating its opposition to the presidential center being built at this location. As a first step, the center’s proposal must be approved by Chicago’s planning department and the city council. That process is not expected to sit any snags, as Obama’s former chief of staff Rahm Emanuel is Chicago’s mayor. “If past is prologue, municipal officials will rubber-stamp their approvals,” Birnbaum said. But the federal process will be more complicated, and that’s where Birnbaum’s argument becomes especially relevant. The Obama Foundation will have to get approval from the Environmental Protection Agency under the National Environmental Policy Act and Section 106 of the National Historic Preservation Act. A spokesperson for Birnbaum’s group said it is difficult to predict how the Trump administration’s EPA will handle it. The first verification process will determine if the Obama Presidential Center would have “adverse effects” on Jackson Park. The State Historic Preservation Office will ask “official consulting parties” to provide opinions. From the perspective of the landscape foundation, Jackson Park and the surrounding parklands are quintessential examples of historic property. “This isn’t just any public open space; this is historic parkland originally designed by Frederick Law Olmsted, Sr., and Calvert Vaux (of New York’s Central Park fame),” the organization’s website states. The park system was designed in 1871, and Olmsted wrote in 1895 that the Museum of Science and Industry was intended to be the only “dominating object of interest” in the park. In 2012, Jackson Park was at the center of another Section 106 compliance review, and officials decided it should not be touched. “As currently designed, the park retains a great deal of its integrity. While some of the original features have been modified, or removed, the remaining defining characteristics such as the overall plan … depicted on the 1905 map must be respected,” the document stated. The foundation is expected to spend much of this year engaged in federal-related approval processes. The Chicago City Council will take up the issue this week. Meanwhile, Obama’s team last week released more information about the center it hopes to open soon. In July 2016, the Obamas announced the selection of Jackson Park, a 500-acre park on Chicago’s South Side next to the University of Chicago, as their preferred site for his presidential library. The spot is near the Museum of Science and Industry, Lake Michigan and the eastern edge of the university campus, where Obama used to teach constitutional law. The location is also near Woodlawn, a low-income black neighborhood that recently has begun to gentrify. The Obamas are longtime Chicago residents, and sought a part of their hometown that needed revitalization but could also benefit from the addition. This week, the Obama Foundation shared dozens of changes to its proposal, including road closures within the park, a revamping of the picturesque landscaping, and a newly designed main building would stretch 23 stories high at 235 feet tall.